Making hummingbird garden plans is easy, fun and rewarding for any gardener and hummingbird lover! The best way to start hummingbird garden plans is with a simple drawing of your garden. 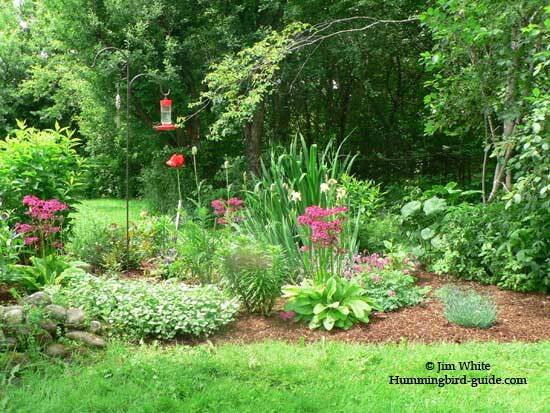 If you are creating a garden to attract hummingbirds then special planning can be included. There are unique considerations to add that have worked like a charm for us. Using a plan will create a much more attractive garden for you to appreciate as well. It enables these tiny, speedy birds numerous opportunities to find these blooms, more flowers to linger at, and more chances for you to watch them. Jim and I enjoy sitting in front of our hummingbird garden with feeders hung in the center to watch our little friends. We chose decorative feeders as yard art to complement the beauty of the flower garden. The hummingbirds are especially busy in the evening zipping from flower to feeder and guarding territory from each other by perching on a nearby tree branch. They are a joy to witness. Here is a video of a young lady dancing for the camera at one of our feeders in our hummingbird garden. It is helpful to choose flowers for hummingbirds that grow best in your region or planting zone. Here is a link to a list of planting zones that will suggest flowers for your zone. If you are looking to buy plants online we recommend this nursery for a large selection of hummingbird flowers and great prices too! Here are a few recommendations for some hummingbird flowers that have worked for us. Choose flowers that bloom at different times (giving the birds a source of nectar throughout the season). Think habitat. Try to create both sun and shade by providing trees as well as open areas. (They can perch in the shade between feedings. This is good because hummingbirds digest food while perching. With the fast metabolism of the birds, they need to perch between each feeding). 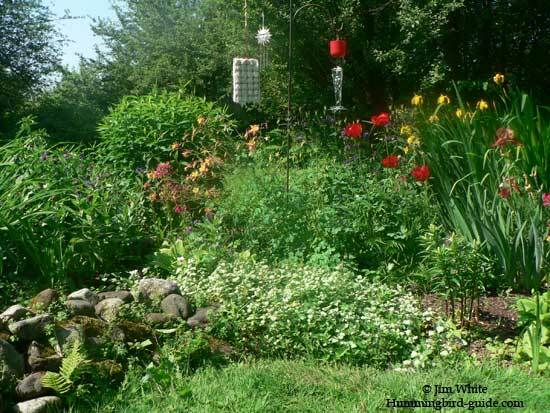 Position your garden where you can easily see it (to watch your hummingbirds). With hummingbird garden plans like these, you can have an enviable garden to show friends and family. You will feel rewarded, enjoy the beauty and your hummingbirds will have a bountiful supply of nectar.